If there’s one thing we can guarantee, it’s that we will all faces challenges during our lifetime. But what to do with these challenges is completely up to us. Do we rise to meet them or run and hide from them? The most successful people in the world know that challenges are nothing more than opportunities for us to grow and learn… if we overcome them. 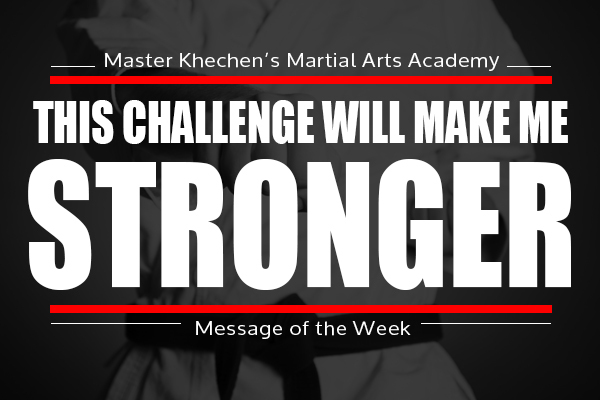 “This Challenge Will Make Me Stronger!” is about understanding that stress is necessary for growth. It’s about having the mindset that being put under pressure is a GOOD thing. We shouldn’t be afraid or back away from challenging situations; we should be thankful for the opportunity to grow! With our first tournament of the year coming up in just a few weeks, we have a great opportunity to challenge ourselves and push ourselves to a new level! Maybe you’re nervous that you won’t do well or are scared to perform in front of a crowd… I understand those feelings and believe me when I tell you that your instructors have all felt the exact same way. But the truth is that a lot of the time the reason we say “NO” is the exact same reason we should GO so we can GROW!